Tyre storage is an affordable and convenient solution to properly preparing your car, whether you’re fitting summer or winter tyres for the change of season, it’s good to know that you can have your current set of tyres stored for just £8 per season per tyre until you need them again. It’s a popular misconception that there is no real use for winter tyres in the UK, when in reality they become useful as soon as the temperature drops below 7 degrees. That’s why it’s important to have a good set of tyres for the changing of the seasons and access to them at a moment’s notice. 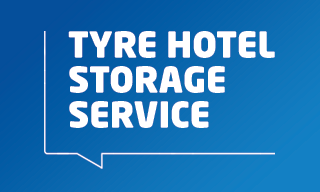 Our convenient Tyre Hotel storage service lets you store your tyres without taking up valuable space at home. When it's time to swap your tyres back, don't panic! We can store your other set of tyres for you just as easily. Take advantage of our Tyre Hotel for only £8 per tyre, per season. Simply purchase (or re-fit) your new season tyres from ATS Euromaster and ask us to store your off-season tyres for you in our secure central network. When the season changes and you are ready to switch back to your stored tyres, call your local branch to arrange a time and date to suit you for us to refit your seasonal tyres. * A fitting charge will apply. Get the most from your tyres with our tyre advice.